Ever been irritated by someone bellowing into their mobile phone in a public place? BBC Radio 4’s Adam Rutherford and Hannah Fry investigate the causes. We’ve all winced at least once at the deafening sound of a commuter loudly conversing with someone on a mobile phone. But why is shouting like this so common? Recently, Drs Adam Rutherford and Hannah Fry have been answering questions from listeners and the BBC Future audience for a new BBC Radio 4 series called The Curious Cases of Rutherford and Fry (listen to the programme at the bottom of the page). One query came from Daniel Sarano of New Jersey, USA. “I have no interest in hearing about other people’s private lives,” wrote Sarano, "the whole idea would have seemed anathema to older generations. I think they would have considered it rude to talk loudly in public." Many people seem to do it without realising, but is there a scientific reason for their loudness? The answer begins by looking at an aspect of telephone design that pre-dates the mobile phone, called “sidetone” – a feature whereby a caller could hear their own voice in the phone’s speaker when talking. This reassures the user that they can be heard, leaving no reason to raise one’s voice. Landlines have sidetones specifically to prevent bellowing in offices and indoor space. But did mobiles do away with them? As acoustic technologist Nick Zakarov notes, no, they didn’t – there are international guidelines that suggest a recommended decibel level for sidetone in mobile phones. But the problem with mobiles is that they are mobile, and a fixed volume of sidetone isn't always sufficient where background noise is very high. Plus, there's also the Lombard effect to consider. This is our natural tendency to raise our voice to match the noise levels around us. We tend to try and match the loudest sound we can hear. A pneumatic drill on a building site, for example. Hence the phenomenon of overly audible mobile phone chats. It’s worth pointing out, however, that this would not be the first time that our use of phones has challenged the idea of good manners. When phones were originally invented, they raised all sorts of questions for Victorians. Should one have a phone conversation when undressed? 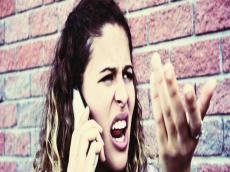 Was it proper to stand up when speaking to a woman on the phone? It seems phones, then, are a technology that may always pose new etiquette conundrums.